Cummins Inc. CMI has signed a Letter of Intent with Isuzu Motors Limited to evaluate prospects of delivering competitive products. Sharing business values, the companies will explore ways to leverage their individual strengths to gain opportunities. Isuzu and Cummins have a significant global reach and are leading developers of technologies. With stringent emission regulations and improving technologies, it has become tough to cater to the commercial vehicle segment. In order to keep up with growing demands, considerable investments are required for the development of powertrain solutions based on diesel and natural gas, along with alternative energy powertrains. Collaborations will play major role for the development of these technologies with shared investments, thus, paving way for increased market share. In the coming months, teams from the companies will be allocated to look for prospects to develop product technologies. Further, teams will explore potential areas of collaboration for a longer-term partnership to develop internal diesel and gasoline powertrains as well as new powertrain technologies. In the past six months, Cummins’ stock has lost 3.4%, outperforming 7.3% decrease recorded by the sector it belongs to. Cummins currently carries a Zacks Rank #3 (Hold). A few better-ranked stocks in the auto space are AutoZone, Inc. AZO, Navistar International Corporation NAV and Advance Auto Parts, Inc. AAP. 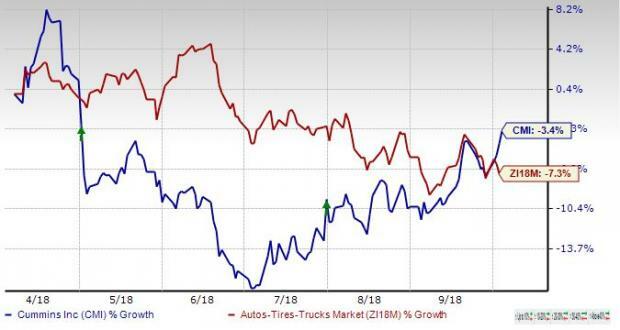 AutoZone and Navistar presently carry a Zacks Rank #2 (Buy) while Advance Auto Parts sports a Zacks Rank #1 (Strong Buy). You can see the complete list of today’s Zacks #1 Rank stocks here. AutoZone has an expected long-term growth rate of 12.2%. Over the past six months, shares of the company have gained 23.2%. Navistar has an expected long-term growth rate of 5%. Shares of the company have increased 9.7% over the past six months. Advance Auto Parts has an expected long-term growth rate of 12.3%. Shares of the company have increased 48.1% over the past six months.